11 years too late, Megatron, 11 years too late. And is it me, or is this line an exercise in "what Class is this figure"? 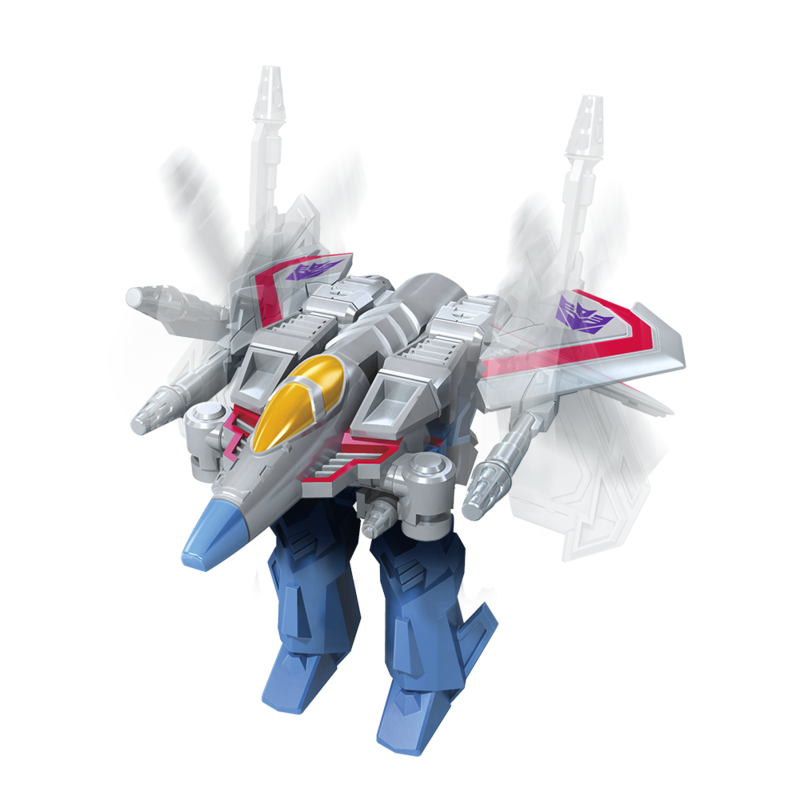 The spinny gun action feature is not for the Warrior Starscream, its the from the other gimmicky Scout Starscream without a full jet mode. Just the Gerwalk thing. It's getting kind of confusing yes. Images post was tidied up and renewsed, to clarify classes and order images properly! I like the concept behind Starscream's cluster missile launcher. 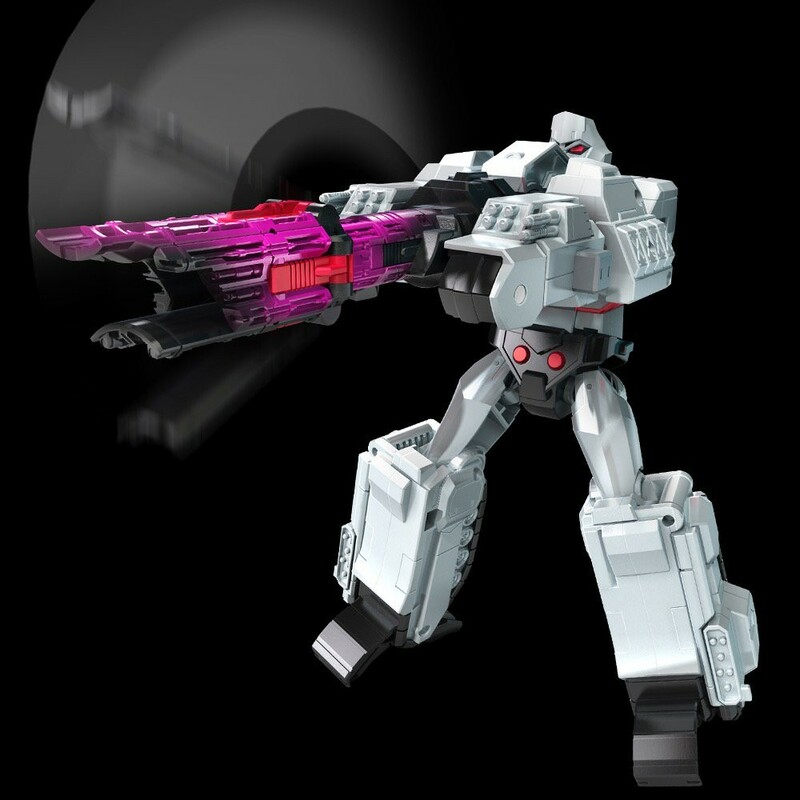 I mean, I don't really need my Transformers to have spring-loaded missile launchers that shoot actual little projectiles, but I would like something that represents their weapons functioning. This is a neat compromise, and unlike a spring-fired missile (1) you don't have small pieces to lose and (2) you can actually display it 'firing'. 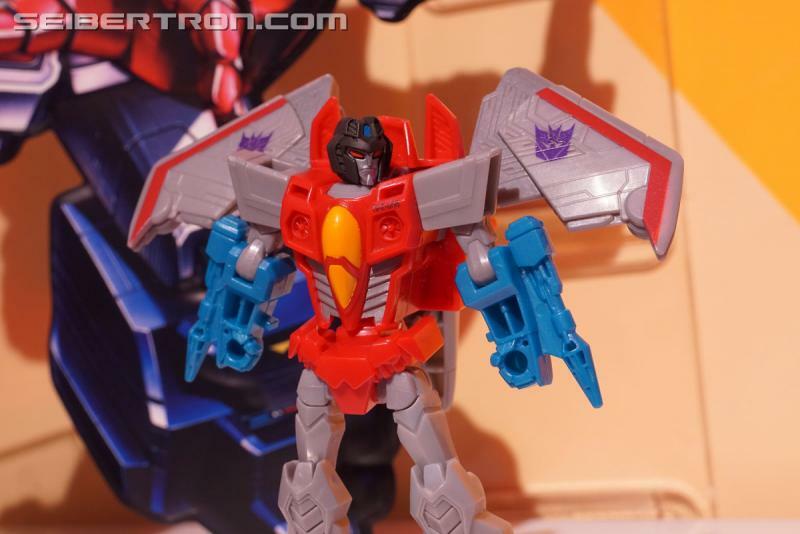 The figure is otherwise atrocious, but I feel like this type of gimmick would look good on a Generations remake of G2 Dreadwing, or another similar character. Actually, the basic concept of a 'firing effect' that comes out of the weapon barrel but remains attached could work well on a lot of figures, or even just their accessories. They could be designed very similarly to the DotM MechTech weapons. Instead of a rifle transforming into a rifle with a knife blade at the end, it could 'transform' into a rifle with a translucent purple muzzle flash at the end. Instead of a missile launcher transforming into a mace or something, it could 'transform' into a missile launcher with a translucent orange contrail attached to a painted missile. If they effects were done as well as TF5 Megatron's flame effects, they could look really appealing on display. 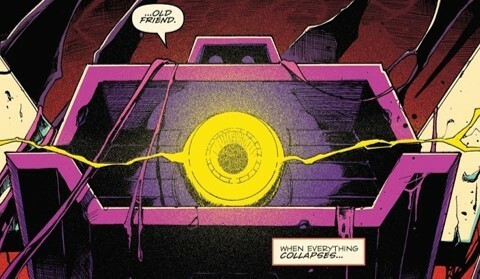 Nice touch, giving Scout Megatron the classic Energon mace. I know, there are obviously no guns like that on the wings, I changed the subject, it just so happened the subject went from one Starscream figure to another. Would have made more sense if you hadn't removed the text from the quote that goes with it. But I can see how what I wrote could be confusing. Gotta admit, that look pretty boss. 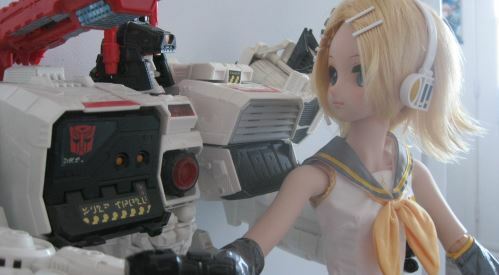 "Looks", but I'll struggle at paying $30 for a Transformers without elbows. I'm fine with basic articulation, but that's a little too basic for me. That begs the question: which do you prefer, elbows, or knees? I don't understand, I quoted everything in your post. I don't believe I removed anything. It was a little confusing, because went from the Warrior class to commenting on the scout class without a break or any indication you were talking about a different toy. It looked like you were still talking about the warrior class and then just pasted in the picture of the Scout class with the gimmick. Overcracker wrote: I don't understand, I quoted everything in your post. I don't believe I removed anything. You cut off the last sentence after the pic where I referred to it directly. Emerje wrote: Hasbro is really sticking it to Harmony Gold with this one. Let's see how this plays out. All the text above the Scout pic was for the Warrior class figure. 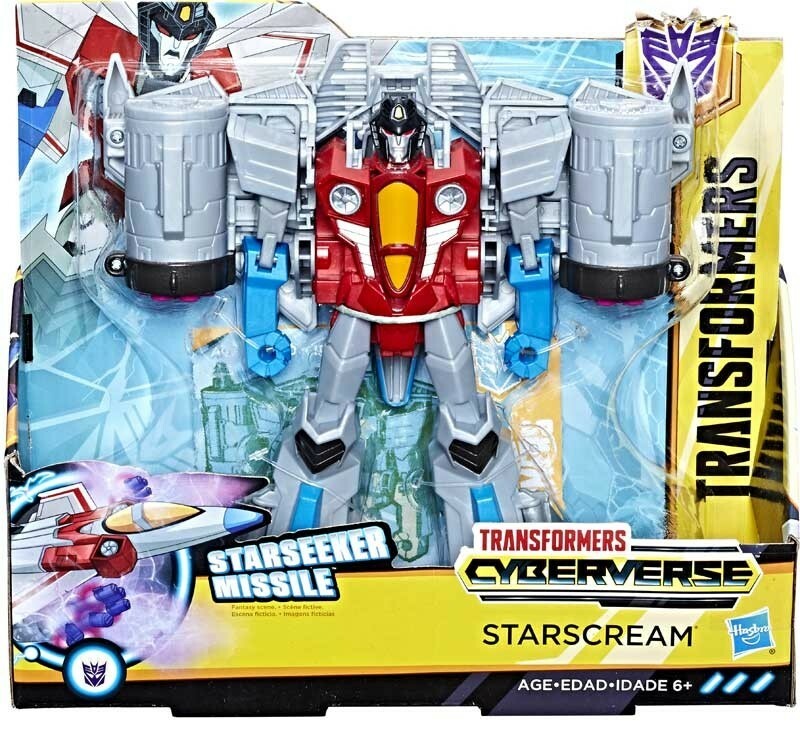 It has been months since we had anything new to share related to the Transformers Cyberverse toyline. Well, now we have some new stock images showing the toys in packaging. We get a good idea at the finished decos here. 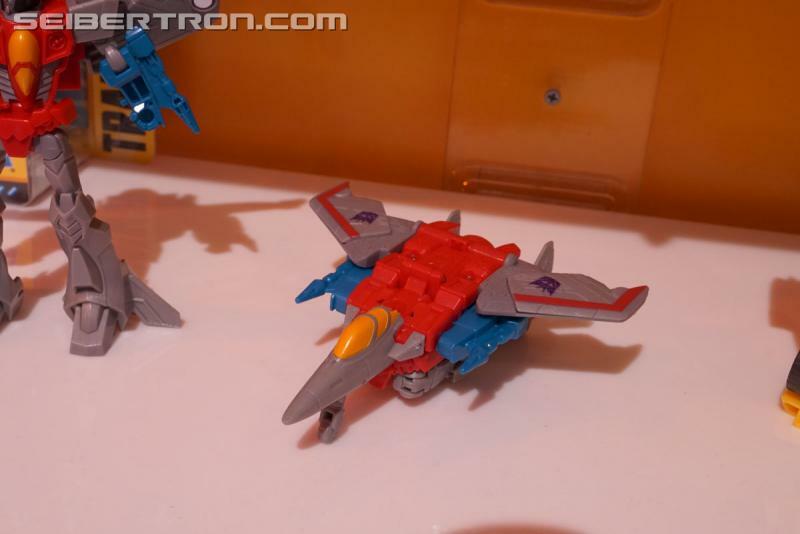 We have images of ultimate class Optimus Prime and Megatron. Some assembly is required on Optimus. These are leader sized toys made simpler (articulation and transformation wise) and at the lower price point of $29.99. 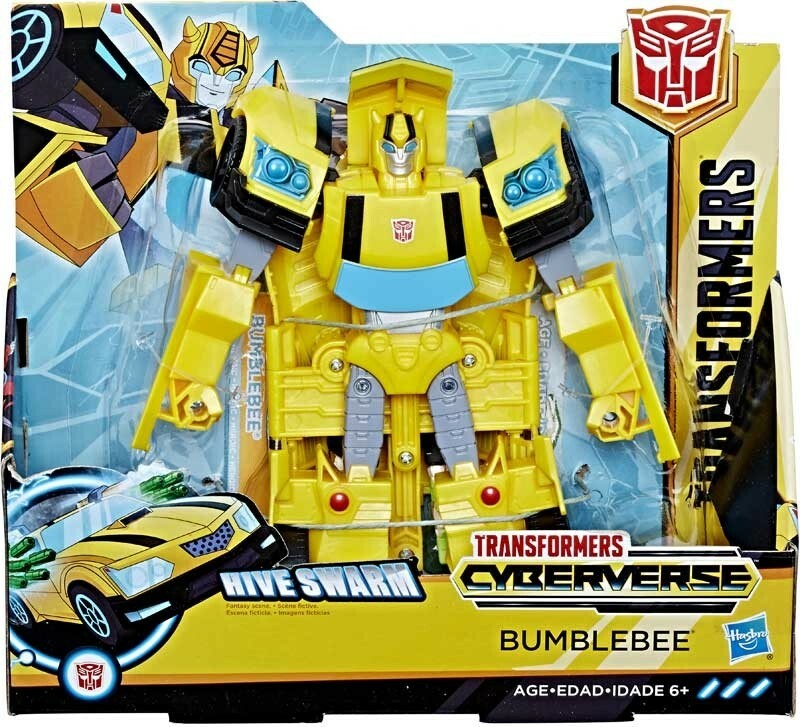 We also have images of ultra class Bumblebee, Starscream, and Grimlock which are voyager sized but priced lower, at $19.99. All these toys are gimmick heavy and made for younger audiences, similarly to the previous Robots in Disguise 3-step toys, but with seemingly better articulation. These images come from NDA wholesaler and we thank Seibertronian Scotty P for sending us these links. 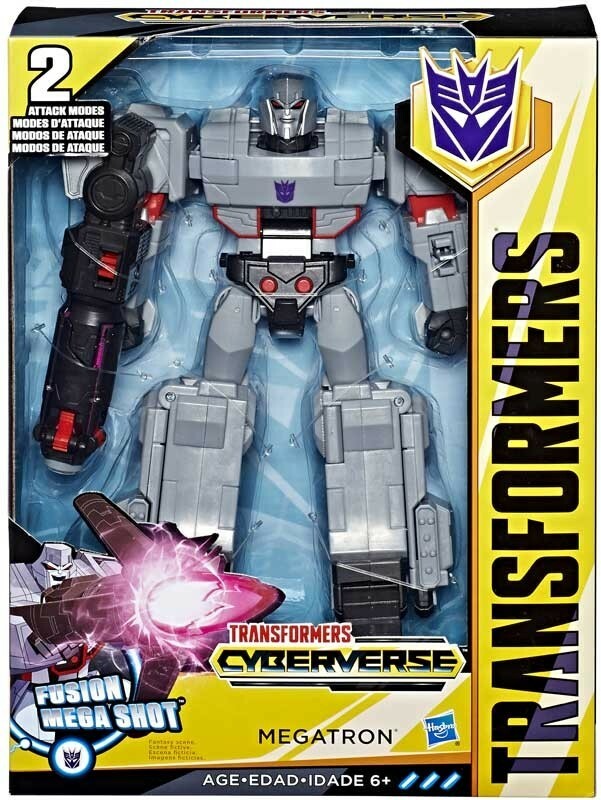 Gotta admit, that Megatron look pretty boss. I'd be tempted. -Kanrabat- wrote: Gotta admit, that Megatron look pretty boss. I'd be tempted. I gotta admit, these figures are slowly growing on me. Except that Ultra class Bumblebee. He still looks like dookie. These look like some of the best Transformers made in years. I just can't get behind some of these recent series. 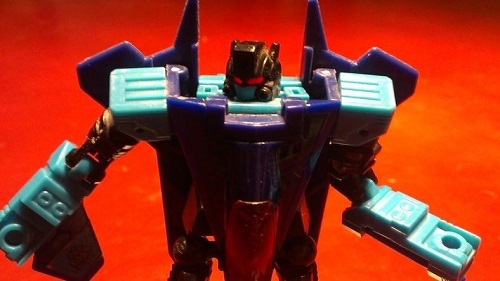 They seem way too similar to the RID figures, which I haven't been overly excited for. There's just a kiddie like quality that I don't generally enjoy with these newer lines. I realize of course that this is a toy line for children, but this one seems too gimmick heavy as well, I've seen too many times when a good figure is ruined for the sake of a gimmick. I hope Hasbro keeps going with two lines, as I've come to view the white boxed figs, (RID, etc.) as the more youth oriented lines, and the black carded boxes as more appealing to collectors. ouraziel wrote: I hope Hasbro keeps going with two lines, as I've come to view the white boxed figs, (RID, etc.) as the more youth oriented lines, and the black carded boxes as more appealing to collectors. The Warriors Class does make a return for this line, with a springloaded gimmick in each figure I believe. Optimus prime is the best one to me, and I might even get him! (Probably not though). 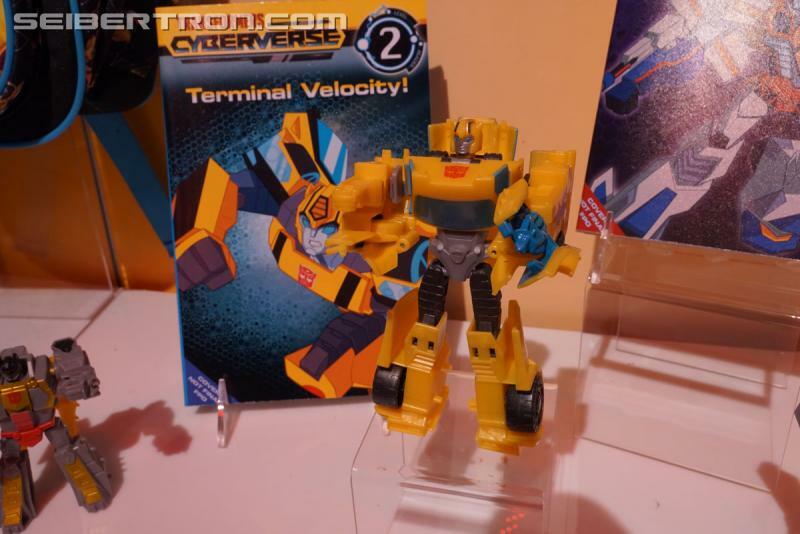 Bumblebee still looks TERRIBLE! 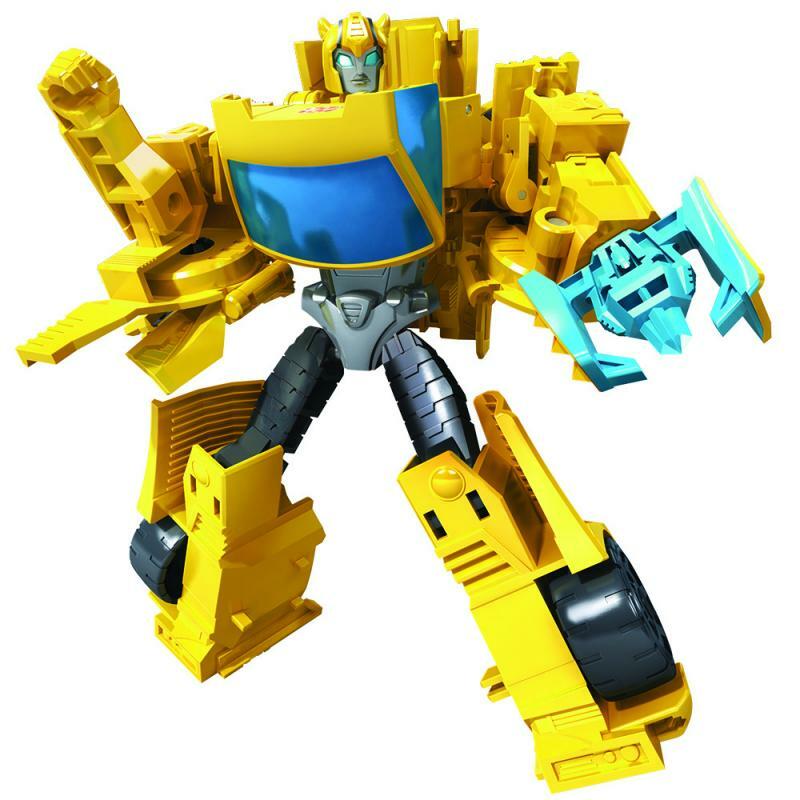 I hope we can get a RID warrior or Generations deluxe quality Bumblebee, because I like his design in the art we have of him. I like the character art! It has a very Animated style to it. 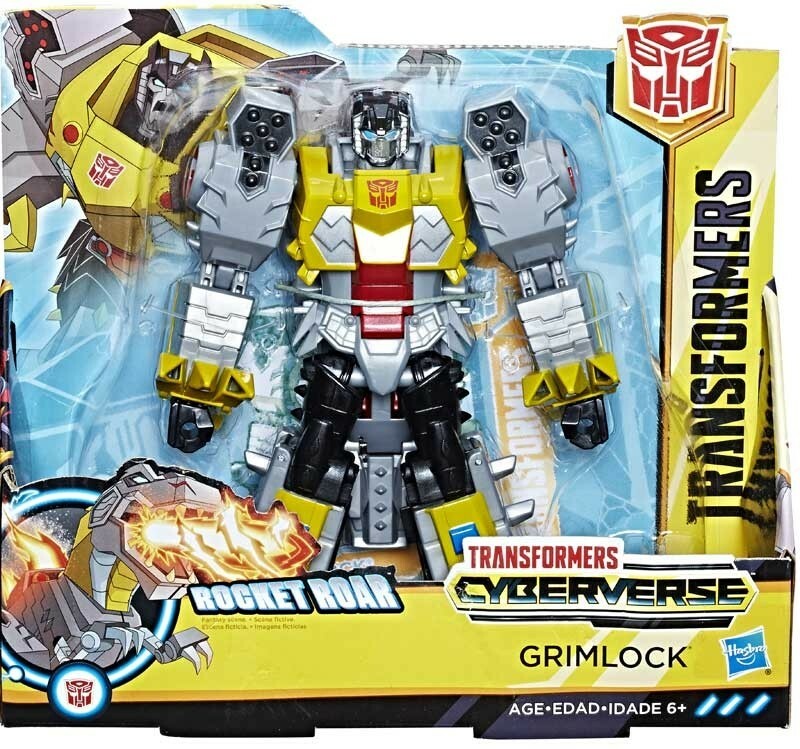 And hey, Grimlock has a mouth in his art not on his toy. Megatron is kinda a butterface. 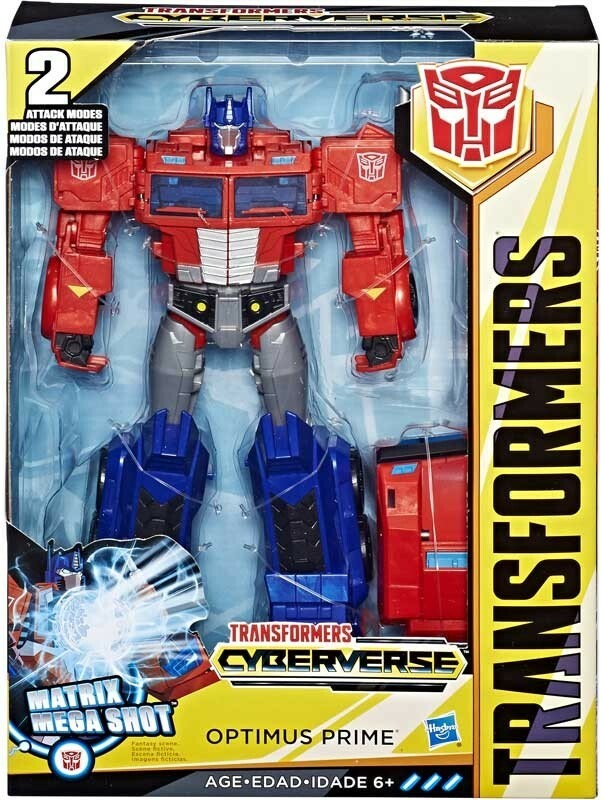 I will say that Prime looks nice though. The others look like fun toys for kids. Not really my style but play features are nice to see. 3,511 pages were recently viewed by 441 unique visitors. This page was viewed 1 times on Friday, April 26th 2019 2:56am CDT. © 2019 Seibertron, Inc. DBA Seibertron.com. All Rights Reserved. Established June 2000. Seibertron.com is owned by Ryan Yzquierdo.